The most important aspect of Photography is to Unleash the Creative You in your photographic style. We will help you look deeper into the technical side of your photography and set you on your way to making your own mark. This workshop is accurate for beginner and Intermediate level photographers. For those who wants to explore their camera or who have lately acquired a Dslr. The workshops are an ultimate guide to learn about the settings on your camera. This two day workshop will give a fair understanding of digital photography, camera operations and handling techniques. How to hold a camera? ISO and what does it do? Relation between Aperture and Shutter Speed What happens to the performance of the lens at various f/stops? Absolutely! This Workshop does not assume any pre-existing knowledge of photography and is suitable for learners of all skill levels. If you are a complete beginner, you should sign up for the Workshop right away, as we're sure you'll find it really helpful! Yes. The fundamental concepts of digital photography are common to DSLR and compact digital cameras, so it will still be useful, and you'll be able to try a majority of the discussed concepts practically if your compact camera has manual controls. However, in order to make the most out of the Workshop, we recommend you hire a DSLR from us for the two days. Please talk to us for details. How do I register for the Workshop? 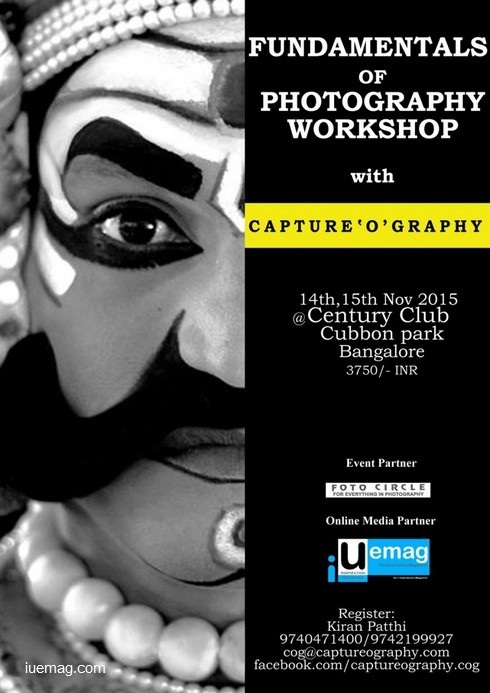 You can register for the Workshop in the contact us page or calling us on +91-9740471400, or emailing us at cog@captureography.com. How do I pay the Workshop fee? We have multiple payment options including online transfer, from which you may choose one as per your convenience. Details will be shared when we receive your enquiry. Please bring your camera and kit lens, a fully charged battery, a memory card with sufficient space for a day's photography, and your camera manual. If you cannot attend the Workshop after paying for it, let us know before the last Monday before the Workshop and we'll give you a credit note for 100% of the amount, which can be used to avail of any of our services. If you let us know after the Monday but before the Thursday ahead of the Workshop, we'll issue a credit note worth 50% of the amount. Unfortunately, if you let us know after the Thursday before the Workshop or do not inform us at all, we cannot issue a credit note, nor can we make cash refunds under any circumstances. Any facts, figures or references stated here are made by the author & don't reflect the endorsement of iU at all times unless otherwise drafted by official staff at iU. This article was first published here on 2nd November 2015.